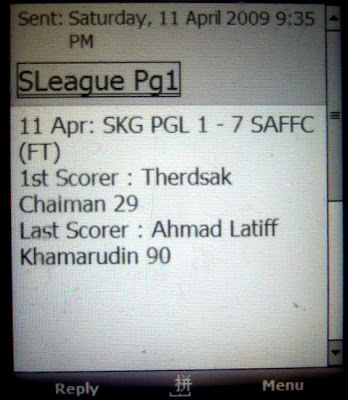 Shell-shocked is too nice a word to describe last night 7-1 demolition of Sengkang Punggol by a revitalized SAFFC. I still struggling to come to term why the Dolphins, after yet another promising pre-season hype up, failed to deliver? 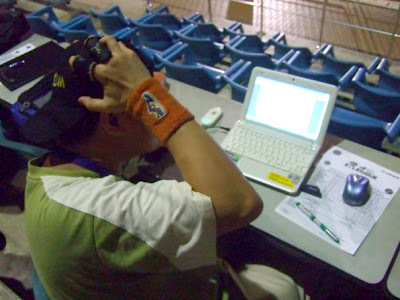 Not reacting to that "shell-shocker" but because of the network jam last night (Picture credit: Mr Gan Meng Yeow of Kallangroar.com). Quality players being signed (the national team skipper, a national team defender, some seasoned players and a group of foreigners who impressed in the pre-season friendlies) and a revamped backroom staff are in place, so what happened? Credit to Sengkang for holding the defending champions up till to almost 30 minutes before the floodgates opened, did had their fair share of chances with Indra Sahdan, Murphy Wiredu el at making their presence felt in the Warriors' box. But with backline comprised likes of Daniel Bennett and Kenji Arai, both whom struggled against J-League champions Kashima Antlers days earlier, standing their way, it's no wonder things were looking tough for the sky-blue outfit. Canadian striker Anthony Bahadur, whose second half consolation goal did little to reduce the deficit, is another player who must have failed to live up my pre-season expectation on him (kind of sad that as I always thought the trio of him, Wiredu and Indra would be the key of the Dolphins, which I hope it's not my naive then that blinded me for me to say that). "Staying positive, looking forward and not dwelling on the past" suggested by a colleague, are the only tasks now for the Hougang-based club. It may be tough to achieve those now, however that's the ONLY way out if Sengkang Punggol really want to stop the rot now. For any players who joined this club should know they have something to prove their detractors wrong, and what could be a better way than to turn the tide around now with Sengkang? 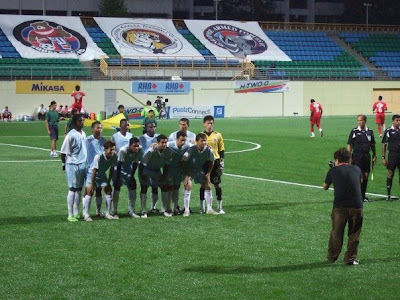 If not, as what another friend commented after their opening loss to Gombak United (the picture above was posted before that game), "Sengkang were JUST PLAYING LIKE Sengkang!" just added something that I was just outside the dressing room right after the game and the reaction following such a big defeat was expected. 'el tat'... You mean 'et al'? Yes, that was the words I'm trying to use.."et al"..
New "hardware" but still same "software", how to improve? Pardon my language but is that chance of something called "jinx"? Anything, the 7-1 thrashing, hopefully is the bottom that set for the team to rebounce as where can be more devasting than this result? hey vincent, whos the software in ur opinions are ?? the coach ?